Content personalization can help in sales, direct messaging, and cold outreach. If you include a users’ name, profession, or other personal factors in direct outreach, it shows that you’ve taken the time to research them and craft your message for them. 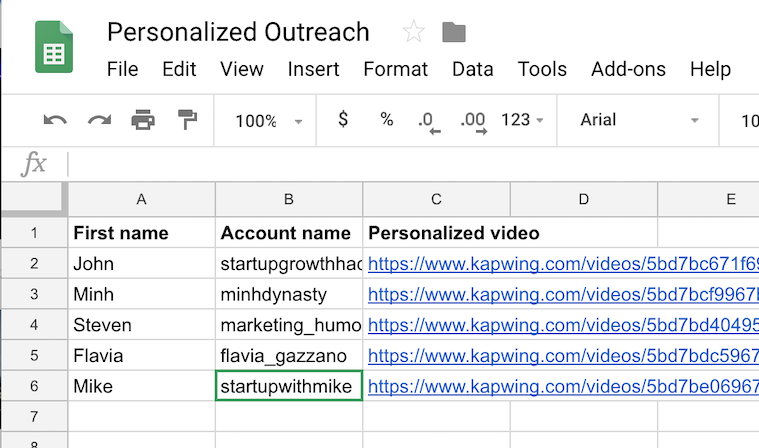 In this article, I’ll share how you can quickly personalize videos, GIFs, and images by embedding a target customer’s info into the media. Using fast tools enables businesses to craft content that’s relevant for their customers at scale. Start by doing research on your perspective targets. Make a spreadsheet with one column for each variable you want to customize in your content. Design your content template with text, images, colors, and shapes positioned in the correct places. 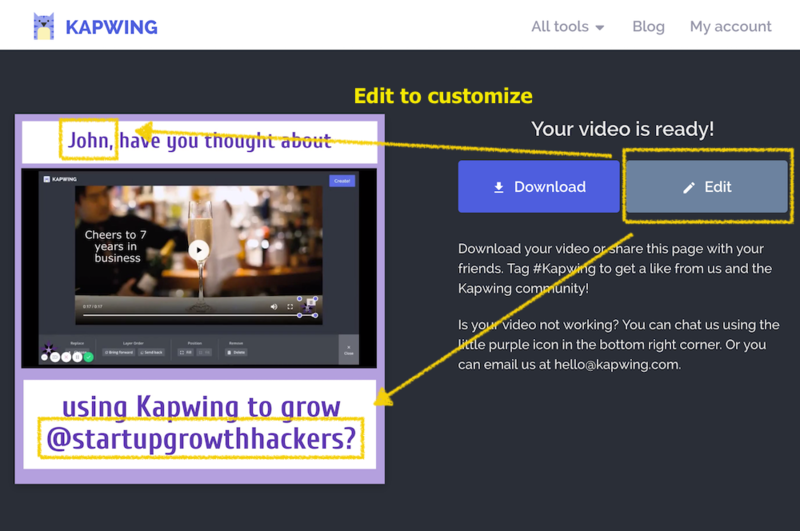 Kapwing supports videos, images and GIFs with free online tools and lets you edit your templates after they’ve been created, so it’s an ideal platform for customizing content. On the Kapwing canvas, add your brand colors, fonts, and watermark. You can replace the text or replace the visuals with custom media per client. After your design is ready, drop in the variables and click “Create!” to generate the custom media. You’ll need to wait several seconds for each video or image to process, but you can copy and paste each URL into a final column in your spreadsheet. If you accidentally miss one, you can always find the media you’ve created from My Account if you’re signed in to Kapwing. After your first piece of content is created, just click “Edit” to go back to the Editor. Your URL won’t be overwritten; once you click the Create button, Kapwing saves a new version of the media for you so that your past work is not lost. Kapwing makes it easy to customize text and images because it automatically resizes, saving content creators time. Once you’ve created each piece of content, download each one and reach out to the intended recipient. Personalized images and video work well when shared through Instagram or Twitter DM or over email. If you’re promoting a service or product, personalization shows that you know who your customers are and care enough to craft a unique message for them. Reaching out to leads with custom graphics, images, and videos makes you stick out from the sea of noisy content. 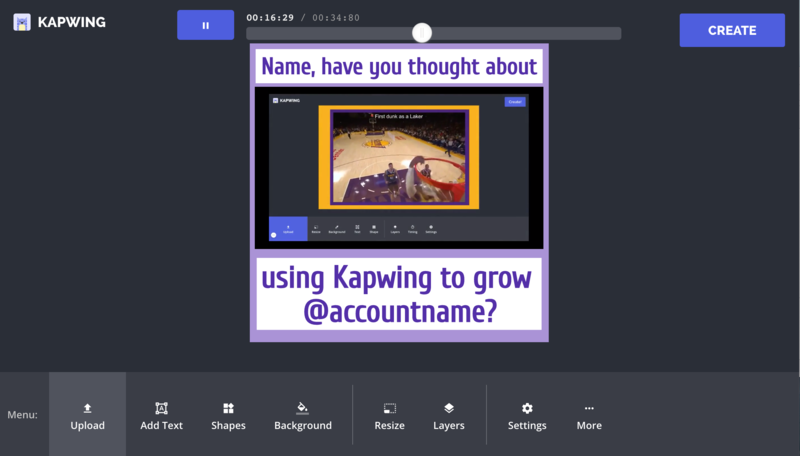 Kapwing helps speed up custom content production by storing designs in the cloud, enabling browser-based editing, and supporting modern media formats like Instagram Stories, Collages, and Memes. It’s one of the few online platforms to support video, and it’s free to use. You don’t need any video editing expertise to try it out, meaning that you whole team can help with content work instead of causing a creative bottleneck. Hope this article helps SMBs and companies expand personalized content efforts! Looking forward to seeing your designs and templates. As always, please reach out over email or Twitter to let us know your ideas for improvement.